What is the first thing that you reach for when you wake up? If you own one, it’s quite likely to be your smartphone. Today, our smartphones are an extension of us, helping us through our daily tasks and keeping us in touch with people through more channels than just a phone call. With this in mind, many manufacturers of digital hearing aids have launched smartphone applications, or apps, that work with your hearing aids. So as well as letting you have face-to-face conversations with people on the other side of the world, now your smartphone can help with your hearing loss too! New digital hearing aids are technologically far superior to their predecessors, even those that are just a couple of years old. There have been huge developments in hearing aid technology, helping hearing aid manufacturers to pack some amazingly useful features into their latest products. One such feature is smartphone compatibility. Several manufacturers have recently released Made For iPhone® aids to help you stay connected to people more easily. 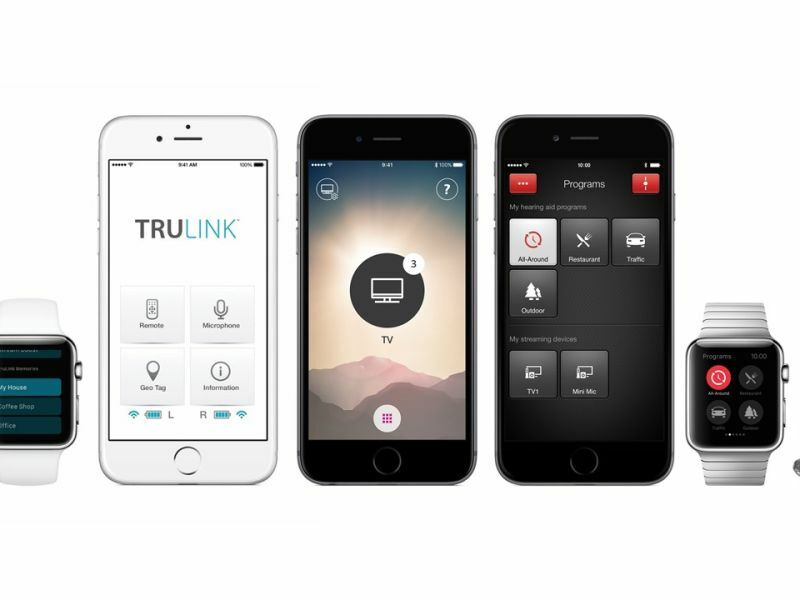 With Made For iPhone, you can wirelessly link your hearing aids, normally through a Bluetooth™ connection, to your smartphone, smartwatch or tablet device. This enables your hearing aids to act as stereo headphones, so you can talk on the phone, listen to music or watch video and have the sound streamed directly to your aids. This gives you fantastic pristine sound quality and makes it easy to enjoy listening to all your favourite music, programmes and people. As well as wireless streaming technology, a many digital hearing aids now come with their own smartphone apps. These work with your hearing aids to give you all the features you would expect, plus some amazing new ones too. Oticon, with their new Oticon Opn hearing aid, have gone one step further than this. The Opn is the world’s first internet-connected hearing aid, and makes use of the Internet of Things, which allows devices with an internet connection to ‘talk’ to one another. So now as well as connecting to your smartphone or tablet, Oticon Opn aids can even work with a Smart TV or other home devices connected to the internet. With this incredible connectivity, the Oticon ON app allows you to control everything around you to make your hearing experience better. Apart from the wealth of useful features available, smartphone connectivity for digital hearing aids also provides simple but significant benefits to hearing aid wearers. It makes it very easy to adjust all your volume and sound settings, literally at the touch of a button, rather than having to fiddle with small controls on the aid itself, which can discourage people from wanting to change settings. Furthermore, you can adjust your hearing aids in public very discreetly, without ever having to touch your aids and draw attention to them. With this amazing customisable technology available, why not visit your nearest Leightons Opticians & Hearing Care for some fantastic personalised service as well? Our experienced audiologists can provide a free hearing assessment to gain a complete understanding of your hearing needs. They will also be able to discuss hearing aid options with you and help you choose a solution that suits you and your hearing needs. You can book an appointment online or call 0800 40 20 20 to speak to your local branch.